Jamaican sprinter Yohan Blake announced himself as an Olympic contender when he won gold in the 100 meters final at the 2011 World Athletics Championships in South Korea. (CNN) — Everyone expected Jamaican flags to be flying high after the 100 meters final at the 2011 World Athletics Championships — but no-one predicted that Usain Bolt would not be performing his customary celebration rituals. The world’s fastest man had to watch as his training partner Yohan Blake took his title in South Korea, with the Olympic champion having been disqualified for a false start. The furore over Bolt’s predicament completely overshadowed the achievement of his 22-year-old compatriot, who became the youngest world champion since U.S. sprint legend Carl Lewis was crowned in 1983 aged just 21. They are firm friends as well as training partners, but when the starting gun sounds at this year’s London Olympics, there will only be one thing on Blake’s mind — scooping another one of Bolt’s titles. Bolt won the 100m and 200m events in record times at Beijing 2008, and earned a third gold in the 4x100m relay, but Blake is closing the gap on his idol with personal bests last year. CNN’s Human to Hero show caught up with the boy from St. James as he turns his attention to performing on the biggest stage of all. 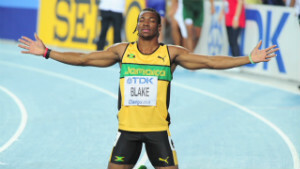 Blake’s sprinting career took off in his early teens when he was spotted running at his school in Spanish Town, and he made a big impression at the Carifta Games — a Caribbean track and field meeting for young athletes. “Somebody just saw me running, went up to my school principal and said ‘You’ve got a new track star there,” and from there it started, from the age of 15 or so I started running,” he says. “When I was in High School I ran the Jamaican national junior record of 10.11 seconds. I was running at the Carifta Games when I ran 10.18 secs in the semis. And I ran 10.11 in the final, so from there I knew I could do something great. “I really have to look up to Usain Bolt because of what he has done. Just to be his training partner and know what he thinks and know what he can do — I have to look up to him. Blake posted a time of 9.92 seconds, enough to beat a strong field in the final but still well short of Bolt’s world record of 9.58. 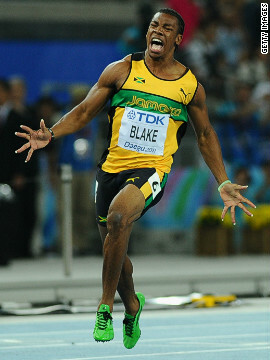 “What happened at Daegu — Usain Bolt is on the world stage and people are always going to look at that,” Blake says. “My first time going into the Olympics, you know, I think it is going to be a breathtaking moment for me. I want to go to the Olympics, have some fun and come back home with some medals. “When I feel it is a big stage for me as the Olympics is where the big times, the big things really happen because an Olympic medal would really mean a lot. “When you have Tyson Gay, Asafa Powell, Usain Bolt and myself lining up for the 100m, I’m always excited because the competition is really good and I want to be the best person on the day, the best person to execute well,” Blake says. “I think that is what the world wants to see. It’s going to be really interesting, all them guys they come out feeling fit and feeling ready to go. “I’m a hard worker and I believe in time — things take time to happen and it’s my time and it’s coming out.